AccuWeather.com Energy Professional AccuWeather, Inc.
Astro Economics Stock Market Newsletter Astro Economics, Inc.
Bernie Schaeffer's Option Advisor Newsletter Schaeffer's Investment Research, Inc.
CEM News Capital Essence Corp.
COMTELL Online Urner Barry Publications, Inc. CONSENSUS National Futures & Financial Weekly CONSENSUS Inc.
DAILY FUTURES NEWSLETTER Artac Advisory, Inc.
Daily Volume Alerts McMillan Analysis Corp.
Econoday Online Economic Calendar Econoday, Inc.
ETF Martket Report by Artac Advisory Artac Advisory, Inc. Formula Research Formula Research, Inc.
Jerry's Weekly Spread Commentary Moore Research Center, Inc.
Joe Ross' Free Chart Scan(tm) Newsletter Trading Educators Inc.
Joe Ross' Free Spread Trading Newsletter. Trading Educators Inc.
Kirkpatrick's Market Strategist Kirkpatrick & Company, Inc. Managed Futures - A Balanced Approach Commodity Futures Options Trading, Inc.
McClellan Daily Edition McClellan Financial Publications, Inc.
McClellan Market Report McClellan Financial Publications, Inc. Morning Grains, Softs, and Rice The PRICE Futures Group, Inc.
PitNews.com eMagazine Gecko Software, Inc.
Price Perceptions Commodity Information Systems, Inc.
PRISM e-Trend Setups PRISM Trading Advisors, Inc.
QPM Radar Quacera Capital Management L.,L.C. Quacera Daily ETF Report Quacera Capital Management L.,L.C. Schaeffer's Master Portfolio Schaeffer's Investment Research, Inc.
sentimenTrader.com Sundial Capital Research, Inc.
Tech Trends Commodity Information Systems, Inc.
Technical Analysis of Stocks & Commodities Technical Analysis, Inc. The Bollinger Bands Letter Bollinger Capital Management, Inc. The Compleat ETF Investor Sphera Research & Trading Inc. 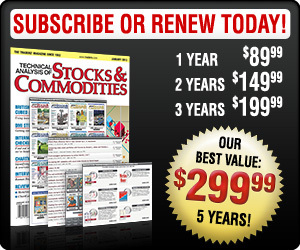 The Complete Commodity Futures Directory Christopher Resosurces, Inc. The Corn & Ethanol Report The PRICE Futures Group, Inc. The Daily Strategist McMillan Analysis Corp. The Energy Report The PRICE Futures Group, Inc. The Option Strategist McMillan Analysis Corp. The Producer Frank Petricca Inc. The Technical Trader AdviceTrade, Inc. The Traders Market Views Traders Network Inc. The Windy City Trader The PRICE Futures Group, Inc.
TNT Commodity Newsletter Gecko Software, Inc.
Trade Winds Weather Trades, Inc.
Traders Notebook Trading Educators Inc.
Traders.com Advantage Technical Analysis, Inc. Visual Trends JL Futures Inc.
Weekly Chart In Focus email McClellan Financial Publications, Inc.
WEEKLY FUTURES NEWSLETTER Artac Advisory, Inc. Working Money, at Working-Money.com Technical Analysis, Inc.